I have always been of the opinion that you shouldn’t hide vegetables, you should celebrate them! I can’t help it, before I was born I was destined to be a life-long veggie lover. It was a combination of the amount of peas my Mom ate when she was pregnant with me, the fact that I teethed on frozen mixed vegetables, and playing in my grandfather’s garden. You better bring your A-game if you challenge me to a pea eating contest. As a kid, I thought that broccoli was cute. I was weird then, and guess what, that hasn’t changed much- I’ve now become fascinated with cauliflower. I am aware that this is another post about cauliflower, but have you looked at cauliflower lately? Just look at all those little branches, sprouting out of one another. 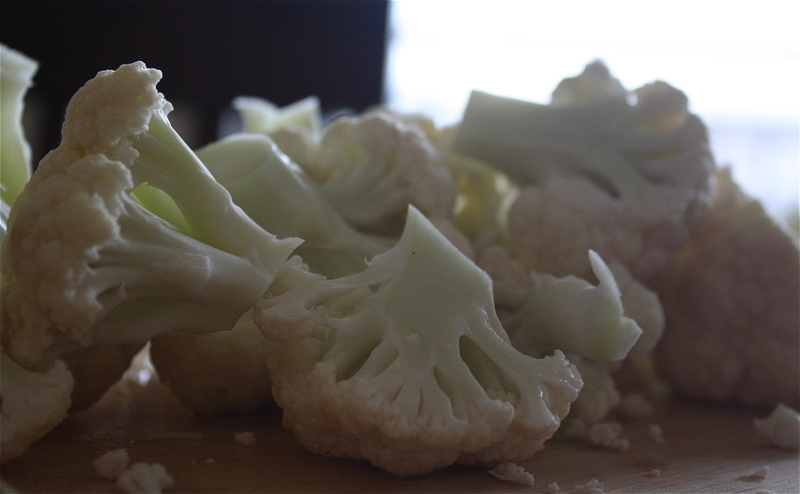 When you cut into a head of cauliflower, it’s a tangle of stems and florets. By far one of the most interesting vegetables to look at, if you’re into that kind of thing. Perhaps you also like eating cauliflower, perhaps you don’t. Perhaps you like eating mac’n’cheese, perhaps you don’t. Regardless of which camp you fall into, this recipe is for you. I recently made this, as well as real mac’n’cheese, for a side-by-side comparison. Mac’n’cauliflower is not a stand in if only the real deal will do; however, it has it’s own merits. To begin, it tastes like mac’n’cheese with a twist. The sauce is lightly flavored with dijon mustard, nutmeg, and of course- cheese. It manages to be creamy, without being heavy. Often, a recipe like this makes up for the swap of cheese with a vegetable by adding more butter, but this is not the case here (and while more butter isn’t necessarily a bad thing, why bother then?). And while this is a cauliflower celebration, it’s hard to believe just how much of this amazing vegetable is crammed into each serving (a quarter head, each!). Veggie lovers and haters, unite! Topped off with homemade breadcrumbs, it’s a crunchy creamy delight. 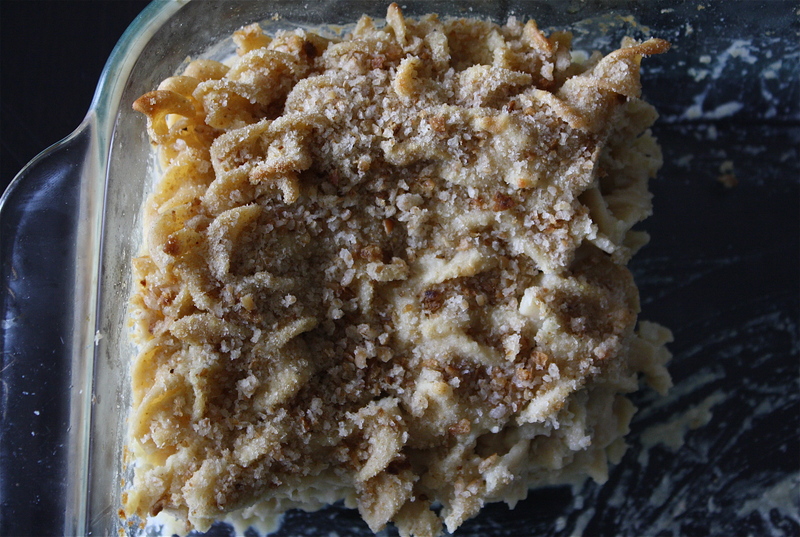 Have you made homemade breadcrumbs before? If not, or you need a bit of a primer, stay tuned for my next post. Heat the oven to 400°F. Grease a 8-inch (or 9-inch) square baking dish with a little oil. Bring a large pot of water to a boil and salt it. If using, put the stock with the bay leaves in a small saucepan over medium-low heat. When small bubbles appear along the sides, about 5 minutes later, turn off the heat and let stand. You can also microwave the stock at half power for 5 minutes for a similar effect. 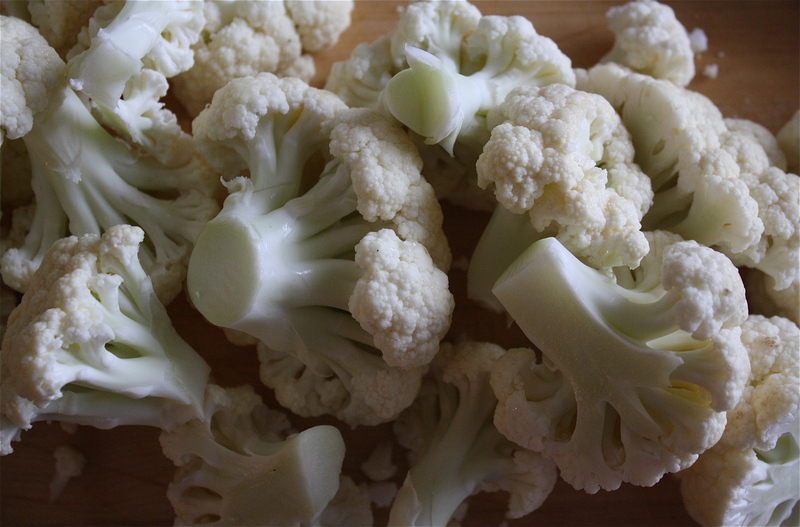 Cook the cauliflower in the boiling water until very tender, 20 to 25 minutes. Scoop the cauliflower out of the water with a slotted spoon and transfer it to a blender or food processor. Add the pasta to the boiling water and cook until still somewhat chalky inside and not yet edible, about 5 minutes. This step is very important, especially if using whole wheat pasta, as if you overcook it you’ll have mush’n’cauliflower. Sprinkle the top with the Parmesan and bread crumbs. Bake until the pasta is bubbling and the crumbs turn brown, 15 to 20 minutes (if prepared the day before, pasta may need a few extra minutes). Serve hot. Recipe just barely adapted from Mark Bittman’s column this summer in the New York Times, happy eating! Love this recipe and the idea of sneaking vegetables into cheesy creamy pasta casseroles 🙂 I made a butternut squash mac & cheese recipe last fall, so I’m dying to make your version for spring. Thanks! 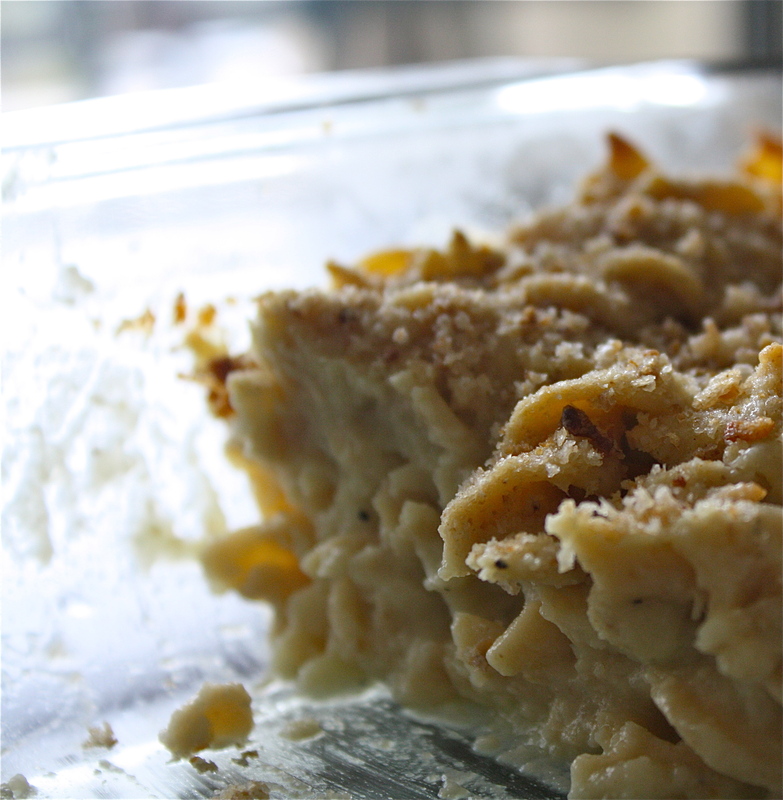 It is a good “mac’n’cheese” for spring, very light! Looks really good. Great way to eat cauliflower. I will have to try this for sure. Thanks! You’re welcome! It’s another great recipe from Mark Bittman.